Short on time? Got lots to check off your 'things to see' list? 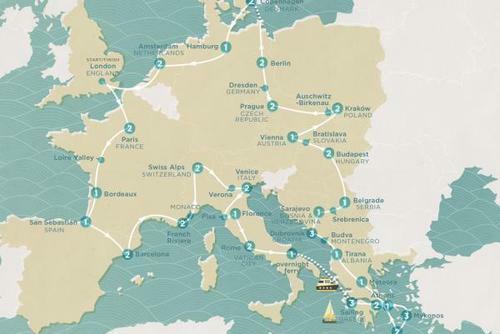 The Best of Europe is the tour for you. Get straight into holiday mode with sightseeing in Amsterdam before driving to Berlin & Prague, finishing in style with a flight to Rome. 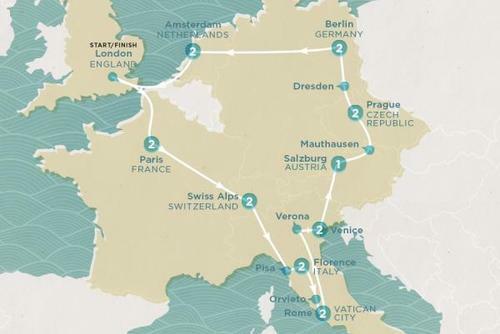 As the name suggests, we've taken all the best parts of Europe, the most convenient forms of travel & combined them all into one action packed trip. Get your cameras, taste buds & walking shoes ready...so much to see, eat & do, in the perfect amount of time to achieve it! Check-in to your hotel and head out into the buzzing, free-wheeling city of Amsterdam for a first taste. Later, meet up with your Contiki crew and Trip Manager over dinner. Jump start your trip and check out Amsterdam’s eye-opening Red Light District, where the creative and wacky come together on narrow cobbled streets, 24/7. Cruise out into the countryside and bike around like the laid back locals, past working windmills, to the world-famous cheese village of Edam. In an intro into Dutch culture, see how clogs are made and try some of the famous Dutch Edam at a cheese farm. There’s free time this afternoon to experience Amsterdam’s coffee shops, museums and quirky, cool boutiques. Wander along the canals and past gabled houses or experience Amsterdam’s multi-ethnic cuisine. This cultural melting pot dishes up loads of affordable food. With an optional evening canal cruise, there’s a chance to get to know the group, unwind with a few drinks and uncover Amsterdam at water level as you drift past the city lights. Motor down the autobahn and get ready for a dose of uber-cool Berlin. We’ll give you the background on Berlin’s troubled history on a driving city tour. 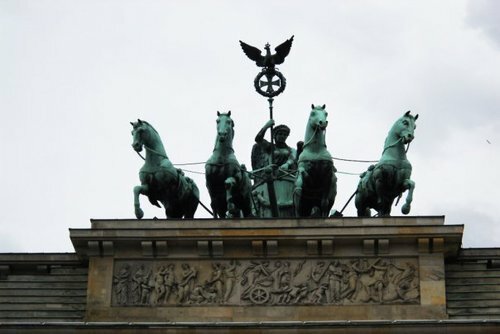 Learn about the East/West split at the Berlin Wall and check out the controversial Reichstag (German Parliament) as well as Tiergarten (one the world’s biggest parks), while you Trip Manager points out the little details and peels back the layers of history. With two nights in this historical hot spot, you’ve got time to find out what makes Germany’s capital one of the most cutting-edge cities in the world. It’s hard to believe that this funky town has had such a troubled past. With free time, get inspired by Berlin’s creative scene and check out its galleries and street art. As a world forerunner in contemporary art, Berlin’s walls are covered in cutouts and graffiti. Visit Checkpoint Charlie, where many East Berliners tried to escape to the West, and be reminded of Germany’s darker past at the Brandenburg Gate. Shopping-wise, this town has it all and is right up there defining style. 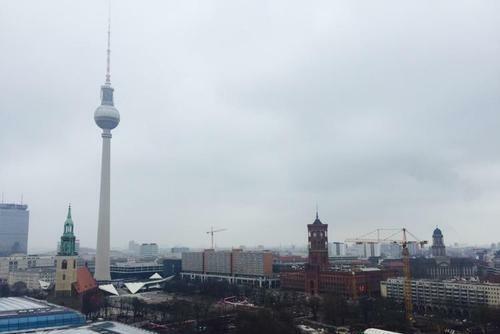 Berlin is great for small boutiques, funky fashions and one-of-a-kind buys. Your Trip Manager knows Berlin’s ins and outs, so get some pointers before you splurge. Do as the Berliners do and grab a currywurst (a local favourite) and kick back at a Bierkeller (German beer house). Experience the world of espionage in an evening Eye Spy Berlin tour with our Local Guide, and enjoy a fascinating look into the Stasi (what was once the East German Secret Police). Then top off your time in Berlin with some of your new friends and explore the city’s legendary nightlife. With cool cocktail bars and some of the best techno clubs in the world, there are heaps of fun choices on offer. Heading south, we roll on to the region of Dresden, often dubbed 'Florence of the North' because of its beauty. This town completely rebuilt itself after being flattened in World War II. Your Trip Manager will show you Dresden’s signature buildings, like the Opera house, the domed Frauenkirche, the Royal Residence – once home to the Saxon Kings – and the massive Zwinger Palace, where the royals went to party! Lunchtime! Go local and hang out in a river side beer garden, order some hearty German dishes with regional specialities like sour roast and potato soup. 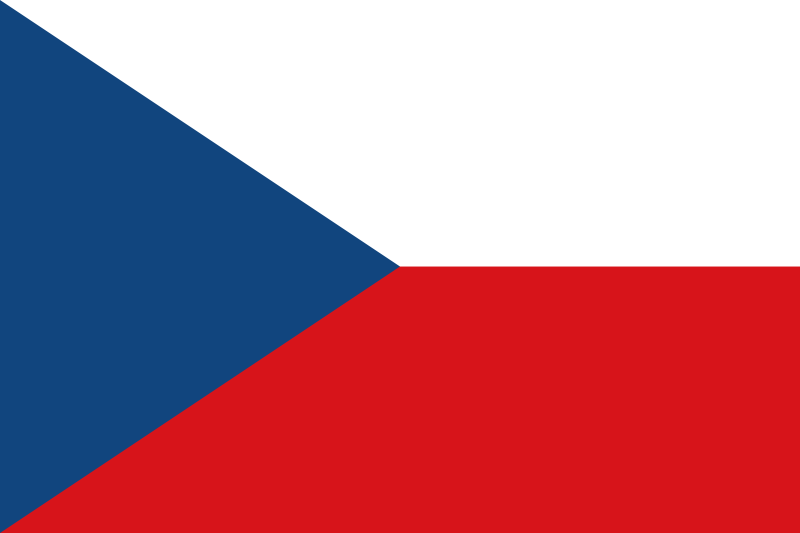 Then we head over the border and into the Czech Republic to Prague. Prague is a beautiful and atmospheric city. It’s also pretty compact, so it’s best explored on foot. 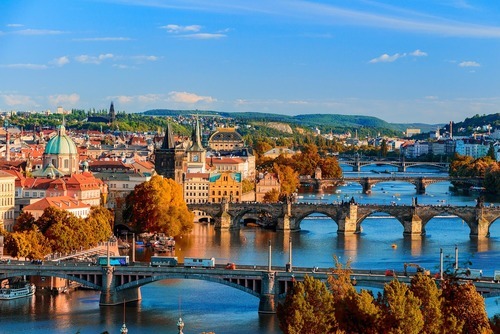 Get straight into Prague’s historic heart with your Trip Manager. 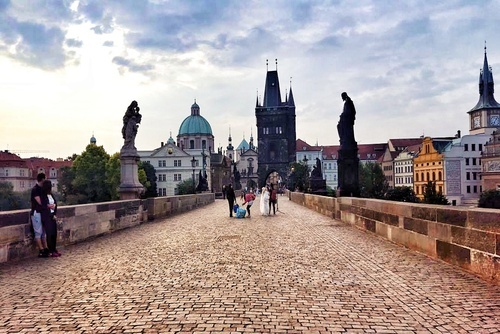 You’ll walk together over the landmark Charles Bridge, through Hradcany Castle, the home of the original Bohemian Kings and to the gothic St. Vitus Cathedral along the way. 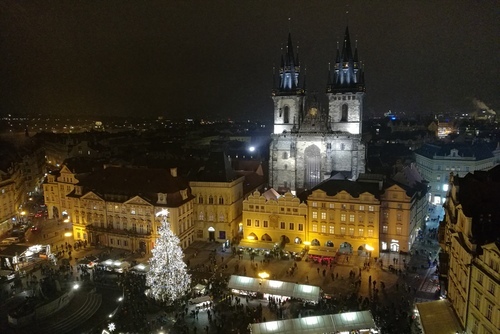 With a night off, spend some time in the picturesque Old Town Square, where historic buildings and churches surround cafés that spill out onto the pavement. With some world-famous Czech pilsner in hand, park yourself at a table, people-watch and try out some of the traditional local dumplings. Have a go on two wheels and discover Prague with our Local Guide, who knows all the city’s ins and outs. Exploring by bike is the perfect way to get an overview of this compact city, as you hit the back alleys and side streets of the Old Town. The Czech capital has a really mixed past so look out for signs of the Holy Roman Empire, the Bohemian Empire, the Nazis and the Communists. Choose a river cruise on the Vltava, which runs through the heart of Prague, and take in stunning views of the city from the water. Free time means you can get deeper into Prague’s Old Town in your own time. The city itself is a UNESCO World Heritage site, with a jumble of little lanes, alleys and courtyards. Slow the pace down and give yourself a chance to uncover its hidden treasures. This is also the spot to pick up some famous Bohemian glass, beads or garnet and amber jewellery. 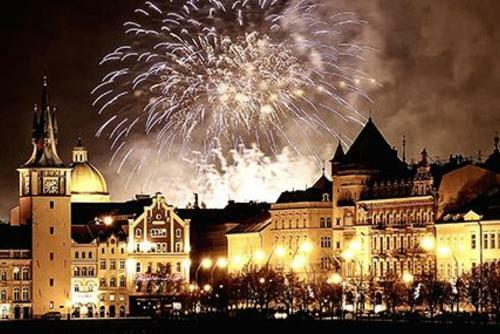 By night, Prague is loaded with all types of music, from jazz bars and hip DJs to opera. There is something for everyone, so make the most of it with the group, and finish off your travels here with a night to remember. 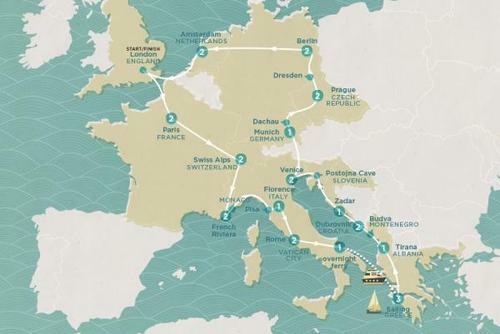 Catch a short flight to Rome. It oozes energy and overflows with relics from another age. Get into the thriving atmosphere of this living timeline as your Trip Manager shows you the Colosseum, the Pantheon, Piazza Venezia and Piazza Navona. Honour tradition and throw a coin in the Trevi Fountain’s waters (to better your chances of returning to Rome!) or maybe hang out with your new friends at the Spanish Steps, sit back with a few slices of pizzas and people watch. With two full days in this hot city, you’ll get a real feel for Rome. Make the most of our Local Guide’s inside knowledge with an optional guided tour of the Vatican Museums, including the Sistine Chapel and St. Peter’s Basilica. Then check out Rome’s imperial glory by visiting the Colosseum and Roman Forum. Take off into the city and absorb the atmosphere, as Vespas flash past timeworn monuments that are surrounded by fountains, pizzerias, cafés and bars. Before you hit the shops, let your Trip Manager point you in the right direction with some tips on the best buys. There is also the option to learn some amazing traditional Italian cooking with our Me Time optional Cooking Class. In your free time, live the local lifestyle by indulging in a long lunch on a paved piazza or knock back a shot of espresso at the bar, like the Romans do. Make the last night of your trip special by hooking up with your friends for an optional dinner. In a typical Roman restaurant, you’ll enjoy an authentic Italian experience, complete with an opera singer, live music and pasta But don’t stop there – afterward dive into Rome’s night action with your buddies and finish your travels off with a night to remember.